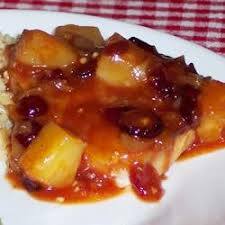 Bahama Mama Pork Chops - Tienditadepuertorico.com - Buy Puertorican Food Here!! Season pork chops with adobo. Set aside. (even better if seasoned night before). In medium bowl, blend reserved pineapple juice with cornstarch. Heat oil and cook garlic and onions until softened. Add pork chops and lightly brown. Pour pineapple mixture over chops and add bell pepper. Cover and simmer 30 minutes or until pork is cooked.